Thrive Content Builder - Why I bought it and why you too should! 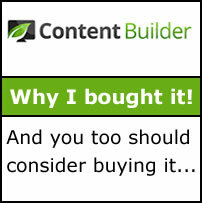 →Why I Bought Thrive Content Builder ~ Why you too should buy now! Why I Bought Thrive Content Builder ~ Why you too should buy now! Thrive Content Builder is one of the most exciting Plugins I have bought in recent times. My ﻿first post I created with this editor has a new visual experience that makes me very excited about the investment. To create beautiful, readable, animated and powerfully attractive and stunning visual content. To make ﻿money as an affiliate. I'll explain more below. Now, once you purchase your copy, you'll have to install and activate like you do with most premium plugins. Doing this will create and save the copy you are going to be editing with the new world editor. If you don't do this you'll see Page Not Found error. If this is already happening to you, don't panic. There is nothing wrong. Just follow the three steps above. There are different content elements you need to make your blog posts less boring. One of the reasons for high bounce rate and less time on site is the fact that your content is clumsy. Beautifully presenting your posts, garnishing and prettifying them with eye-catching animated and meaningful visuals will inevitably improve reading and make your visitors spend more time on your site. Once you are on the page, the thrive builder menu is not hard to locate. The default position (which can be changed) is located to the right of your screen. As content marketers and online businessmen, we need calls to action in our content. Whether you are doing simple blog posts or sales copies, at one point, you need to call your readers to action​. This box above is Style 3 Call to Action box. There are 3 others so you should test out to see which one is good for your design. Thrive content builder comes with an excellent Pricing Table builder. All you need is drag & drop, click to change values with options to bold, underline, italicize, add animations to button elements, add links to buttons, etc​. Seriously, you don't need any additional plugin to do this. You can add a pricing table with up to 5 columns. This tool's flexibility allows you to do just anything. The sample below is a real working demo, not an image! What else do you want to do with Thrive Content Builder? Do you want to create sales copy? ​Now let's talk about adding testimonials to your pages. Whether these are blog posts, sales or lead capture pages, adding testimonials with Thrive Content Builder is a matter of drag and drop, then import images and type text. There are many testimonial plugins out there but quite frankly, you do not need them. Thrive content builder comes with 9 testimonial designs. All you can do is drag and drop, change colors, text, pictures, etc. This actually makes me ask questions if any additional plugin is necessary. What about adding Guarantee Statement to your copy? A guarantee is your word you give out to your prospective buyers to assure them of the quality of your product and give them a time range within which they can ask for a refund should they not derive satisfaction from the product. The video tool bar allows you to insert video from different sources, and a couple of options to control how your video displays on your site. All you need is the video url and not copying of some complex html code. ​The content reveal is an interesting feature used by many video marketers. What it does is reveals some text on the page after a certain time. In the image above, the selected content (text, images, etc) will be revealed after 50 seconds. Just having the plugin on this blog will not generate any sales but promoting it through affiliate marketing will surely get some money into my wallet. The best way to boost affiliate sales is to promote a product you are using. That's because you can share your experiences and results. ​Any one blogging on WordPress can promote this plugin and make money too. As I write this post, I have just sold three copies. If you share your results with your readers, chances of make sales are very high. Install on your blog and play with it. The plugin costs just $67. As an affiliate, you get up to 50% per sale. That means you get $33.50 in cash each time you generate a sale through your link. Two sales will be enough to get your money back. So what's stopping you from trying to make more money? In my ebook, Affiliate Marketing For Bloggers, I shared this tip and more on how to boost affiliate sales. This is really very amazing content building plugin and you have practically shown its features and benefits. Another great review and great post! Do you have it on your blog? Are you promoting it? Enstine Muki recently posted…Studybay Affiliate Program ~ Earn Recurring commissions! Hey hey heyyyy Enstine! Yes my friend. Thrive Content Builder is an AMAZING plugin and is what I am using over on YourChicGeek. I first heard about this plugin from Fabrizio over on Magnet4blogging.net and I am glad that I did! O yeah? I’m excited to hear you have been rocking with this too. It’s such an amazing builder and I can remember when Fab wrote about it. I’m also using thrive content builder plugin on my blog and its truly awesome. Not only content builder, thrive leads and thrive clever widget also very good. Just few weeks ago they introduce their new inversion thrive headline optimizer plugin. Recommend you to try out their headline optimizer plugin. BTW thanks for sharing this detail post with us. Hope you have a great weekend ahead. This is a great way to enhance the way your content looks. Definitely worth trying ! I bought this and I am very eager to work with it but I have found a problem with my site, so working on getting that corrected before diving into this. I like what I see so far. I must say that thrive’s product is one of the best product I’ve ever bought so far especially thrive theme, thrive landing pages and thrive content builder. But i’m not aware of its ability to creating visually compelling, animated content and the content reveal feature. Thanks for highlighted it. Again, what i love about thrive’s product is that its come with great product tutorial via member dashboard and response from the support is also fast. Last but not least, i’m highly recommend all thrive’s product for anyone and i love the way you promote it with this post. Yes, there are great and detailed videos everywhere teaching every function of the products. The team is working hard and the forum too is doing well. Wow! I can’t really believe how cool is that plugin – Super interesting post you crafted using Thrive Content Builder. Really cool! Ya just can’t go wrong with using a visually-appealing content builder dude. Eye candy rocks. Your presentation here proves it. If you design something too busy, readers will flee. But if you spruce things up, with TCB ;), more readers will appreciate your blog and brand. Presentation counts, big-time. Thanks for stopping by bud and the your comment is exciting. I feel awesome editing content with the new editor. The feedback I get too is crushing so I think I have added something awesome to this blog. Thanks for this great review. Like Ryan mentioned, you can’t go wrong with “eye candy” and this makes it so easy to do. This is like having a virtual assistant helping you creating not only content, but with so much more….capture pages, animations and so on…. Thanks for this awesome review …you know I’m going to pass this on. I really do enjoy the way this is simple to use and the results are great too. I have created a few content with it and don’t feel like using traditional editor any longer. Do you have it running on your blog too? Enstine Muki recently posted…How To Write Web Copy That Converts with Jasper Oldersom! This plugin is awesome bro and you are missing a lot by not using it yet. Enstine Muki recently posted…Your phone date is inaccurate WhatsApp Error FIXED! I have thrive leads and I’m quite sure Thrive content builder will deliver even more value. I like all of the formatting, call to action and other features that you mentioned here and it looks like you’re getting more than what you pay for it. Thanks for sharing Enstine! The value in this stuff is quite much and I’m thinking like it’s more than what I spend. I’ve brought this earlier but couldn’t use properly. As a result, my blog posts were looking dull. This content has changed my idea & helped me to build a awesome content as well as save the time. Hey bro did you post that on the forum? I’m very impressed to see all the exciting ways you’ve used the Thrive Content Builder plugin. I bought myself copy a few weeks ago but haven’t used most of the features yet. I know I’ll be learning from you as I read further articles over the weeks. Indeed an excellent review of Thrive Content Builder. Really the features that you have mentioned about the plugin is super awesome. The thing which i like the most is one can easily create nice animated content by using Thrive Content Builder. A very complete and clear description of a tool that can make a site come alive. It certainly has a lot of stylish and eye-catching features that no blogger should be without. It seems like one of those tools that can attract money to the affiliate in no time. The importance of visual appeal should never be underestimated and it seems this plugin provides this in abuncance. It is always good to learn about new tools that can help grow our readership. So if you want to promote an affiliate product that’s proven to sell well, don’t hesitate to try this. Hi Enstine. You have really shown the value of the plugin. I can definitely see how it can make a post or page better. I’m thinking that it could be a good fit for some of my product pages. I will have to look into it more, as well as continue to follow what you do with it. The affiliate option is always a plus. Thanks for being part of this post today. This plugins is a great addition to WordPress and I hope you try that out some day on your sites. I have heard of Thrive content builder and even visited their site. Well I love the way you have used it on the site and looks exciting. Hello Muki – How does the multi-license work for developers? Do you export the pages or install the plugin on your client’s site using your own activation code? I have not used that license but I’m sure it allows you to install on multiple sites and maybe export items. The method is to pre conceive your design. Once you know exactly how it will look like, the next step is drag and drop the objects. BTW, how is your general experience with it? When you wriote about TCB a few weeks ago and I saw it working I immediately have bought it. It has great tutorials and doc’s. So now I’m experimenting with this really helpfull and time-saving tool. I have no idea if affiliate marketing works in my field of education in the Netherlands. Nice item for a talk with Jasper. Yes there are quite many tutorial videos to help users and you won’t regret every buying this plugin. Yes Jasper should come in with some helpful information about Affiliate Marketing in your area. However, if you have bloggers reading your blog, they should be interested in the plugin too. Found this in search while trying to figure something out and thought “Hey, that’s Enstine!” I love, love, love TCB. You and so many other readers told me to get it after I posted about Visual Composer. Kim kept raving about it so I got it a month ago. This leaves VC in the dust! LOL Thank you. I do remember that post you created about VC and I’m looking forward to (this time) a comparative post. If VC is been relegated to the dust, it therefore means TCB has some options that make it better. Any chance of having that VC vs TCB post? This is great post indeed.Thrive content builder is one of the plugin which helps the blogger to create his content in awesome style and in unique style. Thrive content builder allows you to design professional sales copy with visuals that boost sales. Thanks to share these lines with us.